In 1968, Ralph and Lucille (Sis) Ehlenbach purchased Fenlon’s House of Cheese in DeForest, Wisconsin. They ran the small cheese and gift store under that name until 1972, at which time they changed the name to Ehlenbach’s Cheese Chalet. In 1972, Jim Ehlenbach began working with his parents at the store and eventually became store manager. In 1986, Ralph Ehlenbach passed away. Jim then took over ownership of the store and carried on the family business. In 1987, Jim expanded the west side of the building. He added a sausage case, a cheese deli, a drink cooler, a larger gift display area, and new bathroom facilities. He also added a walk-in cooler which he used to age cheddar blocks. Ehlenbach’s is renowned to this day for its fine aged cheddar. Jim’s son, Brian, started working at the store in 1992. Over the years, Jim trained Brian in the hopes that someday he might want to take over the family business. In 2001, Brian married his high school sweetheart and co-worker Karie Kopplin. In January of 2002, Brian and Karie took over operation of the family business. Although Brian and Karie have modernized some things at the store, the original theme of Ehlenbach’s remains the same. For example, they still hand-cut all of the cheese the same way that Ralph and Lucille did almost 50 years ago. They also deal with some of the same cheese vendors that the family has used since 1972. Brian also ages his cheddars and swiss, just as his father taught him. Service Area: Madison, Milwaukee, Janesville, Kenosha, Oconomowoc, Wisconsin Dells, Racine, Holmen, La Crosse, New Berlin, Stevens Point and surrounding WI communities. 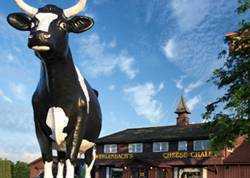 Page Summary: Ehlenbach's Cheese Chalet offers wisconsin cheese, cheese shop near me, cheese store and cheese curds near me. Products such as cheese store near me, cheese maker, online cheese as well as wisconsin cheese stores are also part of the scope of our business. We also specialize in wisconsin cheese factory, cheese in wisconsin in Waunakee, Milwaukee, Kenosha as well as WI. Other areas we serve include Sun Prairie, Janesville, Stoughton and Madison. We also service Middleton, Portage and beyond.